Let’s face it… money is tight for so many of us. 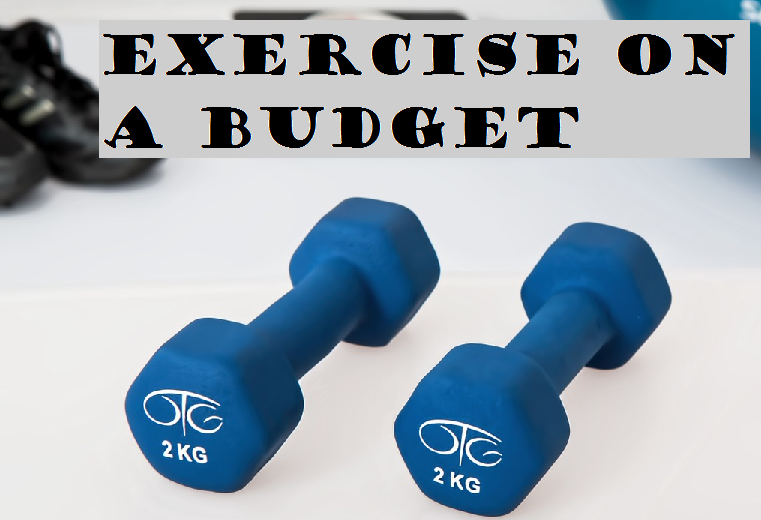 We don’t have the money to spend on a gym membership, especially when we’re just starting out with our healthy lifestyles. The good news is that there are an abundance of ways to get exercise in virtually for free or low cost. It is important to have good comfortable workout shoes. Invest in a good pair from a running store if you can, or make sure a cheaper pair fits you well. I know I started out with a $13 pair of shoes my mom got me, then bought a pair from Payless for half price for $10 after that. I bought the ones that supported my feet best, and Champion brand because they had treated me well before. However, the cheap shoes only last six weeks or maybe eight if you’re lucky, simply using them a moderate amount. So I only recommend doing that if you need to in order to get started. After those Champion shoes I got some Brooks Ravenna 5’s and they ended up being the perfect shoes for me, although a bit pricey of course. Those lasted me eight months, walking quite a lot and even dipping into running with a Couch to 5K program. Other than that, comfortable and supportive workout clothes are a must, but that could mean a simple tee shirt and some comfortable pants, made for exercise or not. I started out wearing what I had. Thankfully most of what I had were exercise capris/pants already, and I had plenty of tee shirts because they’re my main shirt-wear! Walking or running. You can find good Couch to 5K programs on Pinterest or other places like Jeff Galloway’s website that don’t cost a thing. Walking is such a great way to get started in an exercise routine too because you can go at your own pace, make it interesting by varying your routes, and easily work your way up. Body weight exercises such as squats, lunges, pushups, sit-ups, kicks and punches, walking in place, etc. Local playgrounds or parks. Go climb on the playground equipment or run around the grassy areas with or without your children. Sports. If you have sports balls, Frisbees, etc. around your house or yard, play some with family members or friends! This is such a fun way to get active and also interact with other people! YouTube or Spark People videos. There are so many you can find on those places. Although, I have to warn you that YouTube videos get deleted quite often, and you can find more of the same stuff but it requires searching through periodically… at least in my experience. Pinterest. There are so many workouts and exercise routines posted to Pinterest all the time. I advise caution with these though, I have seen some that don’t look too safe. So be careful and be realistic about what your body can do so that you don’t injure yourself, but really that’s true of any exercise routine anywhere! On Demand videos from your cable provider. I used the walking videos on mine because they were something I was comfortable with and could do, and also tried some of the kickboxing videos, but there are so many others that are free too! Exercise DVDs to workout from home. If you use Amazon or eBay you can get these relatively cheap, like $5-10 apiece for older videos. My favorites are Leslie Sansone’s walking videos and Biggest Loser Cardio Max. Equipment such as dumbbells, jump ropes, and hula hoops are low cost as well. Local community centers sometimes offer low cots for monthly access to exercise equipment/rooms. Parks and Recreation programs are sometimes a good way to go, although some of their programs can be pricey depending on where you live. Some have walking groups for low cost though, so you can get that group atmosphere and socialize. Most offer some sports leagues or other exercise groups as well. Gym memberships are still an option if you have places like Planet Fitness near you that offer low cost monthly memberships. These are definitely viable options if you don’t have childcare to factor in or have someone to help with childcare. Relay racing, yourself or others racing yourself or others certain distances to see how far you can run. Possibly setting up checkpoints or even timing yourself to see improvements. Obstacle course in your yard using what you have: boxes, metal/plastic or other durable boxes, ropes or jump ropes, mini trampoline if you have one, hula hoops, etc. Anything you can jump on or around or over. If you can’t jump, step on, in, around, or over. Exercise video “channels” such as Daily Burn (free 30 day trial then $12.95/month), Blogilates is free on YouTube, Jessica Smith on her website and YouTube channel, or Fitness Blender (individual workouts are free while downloadable ones are $4-8). So get cracking on that exercise! No or low cost options are all around you if you just take a look! You don’t need any fancy equipment or clothes to get started. That stuff can be fun, but it’s definitely not necessary, especially at first. Bust through the excuses and go enjoy yourself. Posted on September 29, 2015 October 28, 2015 by Bonnie McConaughyPosted in Exercise, FitnessTagged Exercise, Fitness, Health, Losing Weight, Weight Loss. Previous Previous post: You are Beautiful, You are Worth it! Next Next post: Are You Struggling to Eat Enough Protein? Bodyweight training such as calisthenics and gymnastics is all a person needs. It is most functional incorporating strength,flexibility, mobility etc. Love it. Sounds like a really fun way to get in exercise! I can imagine that it incorporates all of the aspects of fitness. Someday I’d like to try gymnastics again. Last time I tried it was in a summer camp when I was about nine years old.